The sun played hide and seek this week as storms continued to move through the Central Coast, but whenever it did make an appearance, so did the butterflies. 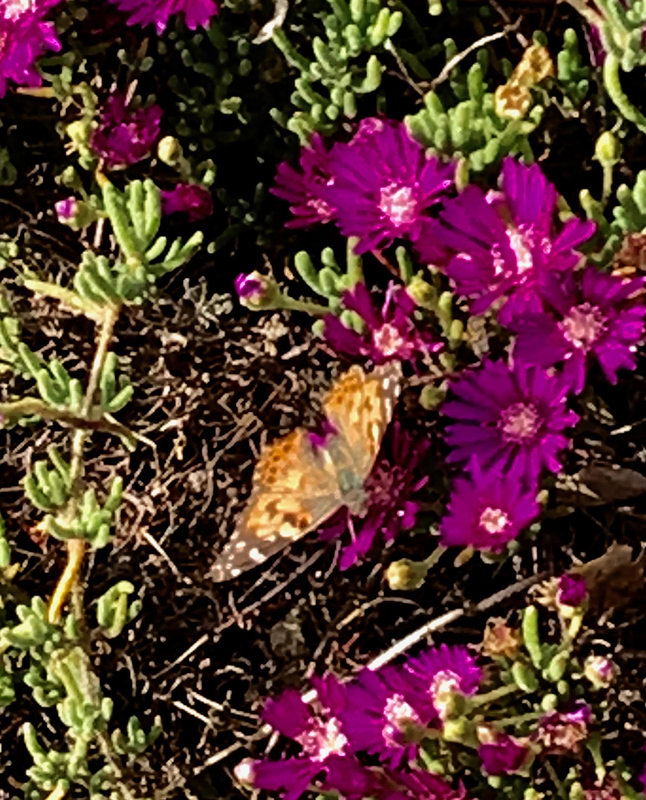 Painted lady butterflies, stragglers from a vast hatch in the deserts of Southern California, flew hither and thither through Salinas fields and over Monterey Peninsula roadways this week. They were also sighted throughout Santa Cruz County. The small orange-and-black butterflies darted overhead, often singly but occasionally in groups, in a steady flow that added up to hundreds over a few hours of observation. They danced in the air above blooming ceanothus and rockrose, lighted on flowers for a brief sip of nectar, and spread their wings wide while warming themselves on rocks. And then, zip, they were off again on their trip up north. Such masses of painted ladies are a regularly occurring phenomenon, according to Dr. Art Shapiro of UC Davis, a distinguished professor of evolution and biology who has been studying California butterflies for almost 50 years. “The migration happens every year. It was very thin last year. When it’s thick, like it is this year, everyone notices it,” he said. Shapiro notes that the last big migration, in 2005, saw as many as 1 billion painted ladies fluttering northward in their trek to the Pacific Northwest. The current hatch isn’t quite as large, but social media has called more attention to it. And this one has lingered, with cold and wet weather slowing the insects’ progress, and perhaps even blowing some off course for a bit. Substantial painted lady migrations are associated with rainy El Niño years, and this past winter was particularly wet in California deserts, also leading to the current wildflower superbloom, so spectacular this year it can be seen from space. The painted lady assemblage began at the beginning of March in the southeastern deserts of California, and drifts of butterflies are still fluttering north to Oregon, Washington, and even as far as Alaska. Where are the determined butterflies going, and why? They’re following the spring bloom — their food source — as plants push out blossoms that provide nectar to the butterflies. But due to fat they’ve stockpiled in the caterpillar stage, the butterflies can fly for many miles before having to refuel, Shapiro said. Some people confuse the painted lady butterflies with monarchs, since both are orange and black. “I’ve had people say, ‘It’s a miracle! I saw thousands and thousands of monarchs!” said Shapiro with a chuckle. Of course, he sets them straight. While it is thrilling to see all those painted ladies overhead, the reality is that the Western monarch butterfly is being found in far fewer numbers. Its population has plummeted 86 percent since late 2017, according to the Xerces Society, an international nonprofit that counts monarchs each Thanksgiving. Habitat loss and pesticides are blamed for the decline; scientists are rightly worried about their future. However, painted ladies are much smaller, with a different wing shape than monarchs, and move much more quickly and erratically as compared to the slow, stately glide of the monarch butterfly. Still, it’s a special experience to view a natural phenomenon that only happens every so often.